When studying or learning Spanish abroad, in a country like Costa Rica, the learning experience will never stop. A study abroad program will immerse you in day to day life where speaking, reading, and listening skills will be necessary to succeed in your communication process. Living in a different culture means that you will have to solve daily life problems by expressing yourself through a foreign language. Studying abroad will help you not only with grammar and pronunciation, but also to apply concepts learned in class directly in normal situations around you. It is important when studying abroad, to force yourself out of your comfort zone, remember that Costa Rican host families are more than willing to help you practice what you learn in class. Furthermore, the host family environment is the best place to start practicing conversations with different topics. Costa Ricans are famous for their hospitality, always trying to start conversations with people like you. Ask a waiter for the menu, ask people for directions and landmarks. Ask for recommendations for shopping or places for a good coffee, you name it! No matter if you feel embarrassed the first time you are talking with strangers, keep trying and soon you will see that you will get better and more fluent over time. Escazú is famous for its culture and unique places. 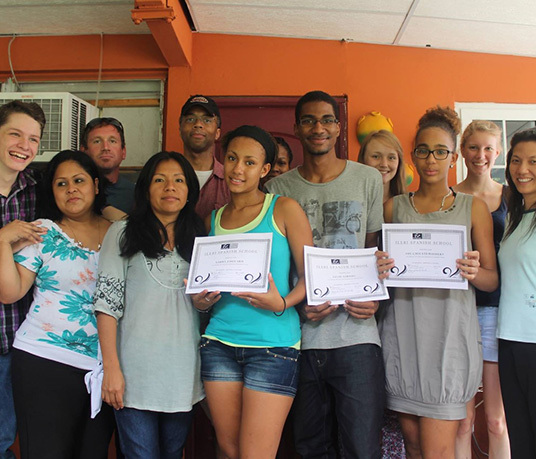 Take advantage of your stay by taking classes that might interest you at ILERI Spanish School. While learning Spanish abroad you will have the opportunity to learn more than just Spanish. With our program you will choose classes from: Marimba lessons, Costa Rican cooking classes, dancing, biodiversity, and nature. When learning Spanish abroad you will face the transition from classroom Spanish to real Spanish. The best way to practice real Spanish is to push yourself out of your comfort zone. Most importantly, interact with native speakers in social situations (local activities, slang, or common words). The immersion Spanish program helps the student in learning a foreign language through the surrounding culture. It makes the student catch the language in an easy way because of the direct interaction between the family, student, and the environment. Level of Spanish: The level of study will be determined by a written placement exam given on the first day of classes. Written exam will be given. Methodology: We use the Total Immersion Method to help you learn Spanish quickly and thoroughly. Classes will be conducted in Spanish. Discussions on topics of interest and written exercises are an integral part of our program. Classes: To ensure personal attention, we limit classes to 4 or 5 people. Upon completion of the course students will receive a certified diploma. Also we offer special Spanish classes for different professions, seniors, and teenagers. Length of Program: Choose from 1 week or more according to your needs. Classes are 4 hours daily from Monday through Friday, either mornings or afternoons. There is a break during classes. The school is run by professionals with degree in teaching Spanish as a Second Language. Teachers have many years of experience in teaching different levels of Spanish (beginners, intermediate and advanced). We teach people of all levels of Spanish fluency and all ages. We also take the students to field trips in order to immerse them in our Costa Rican culture. Spanish classes with homestay: group or private lessons. We have group classes and private classes. For group classes, we do not have more than six students in each class. The private classes are one on one. The student can decide between group sessions or private tutoring if preferred. The classes have the same structure and the student will have the same activities. This program is made for: teenagers, volunteers, professionals, university students, seniors and adults in general. We have different Spanish levels: beginner, intermediate and advanced. Lodging with the family with breakfast and dinner. Laundry service at the host family. School activities: dance lessons and cooking classes. Free coffee during classes. Free WLAN internet at school. Spanish Clases and culture without homestay: group and private lessons. This program is made for students who want to stay in a hotel, hostel, in an apartment or at a friend’s house. 4 hours of Spanish instruction daily. Group classes: We have no more than six students in each class. Students can participate in the same activities of the rest of the classes. If the student wants to improve the Spanish rapidly because they need to work or they only have few weeks in Costa Rica, we offer this private Spanish program in order to communicate with the local people. Also, if a student feels more comfortable learning through a step-by-step methodology, we offer a technical Spanish program. Our Private Lessons will help design your own schedule according to your needs. We recommend this program for all kind of students such as volunteers, residents or expats. They will experience real life situations in which they will have to handle different scenarios such as: running errands, buying food at a grocery store, and talking to native speakers (taxi drivers, cashiers, etc.). These situations will let them have confidence in their Spanish skills but also improve their cultural ability. 4 hours of Spanish instruction daily School registration. 1 hour of cooking classes or dance lessons. Free coffee during classes. 1 hour of cooking classes or dance lessons.